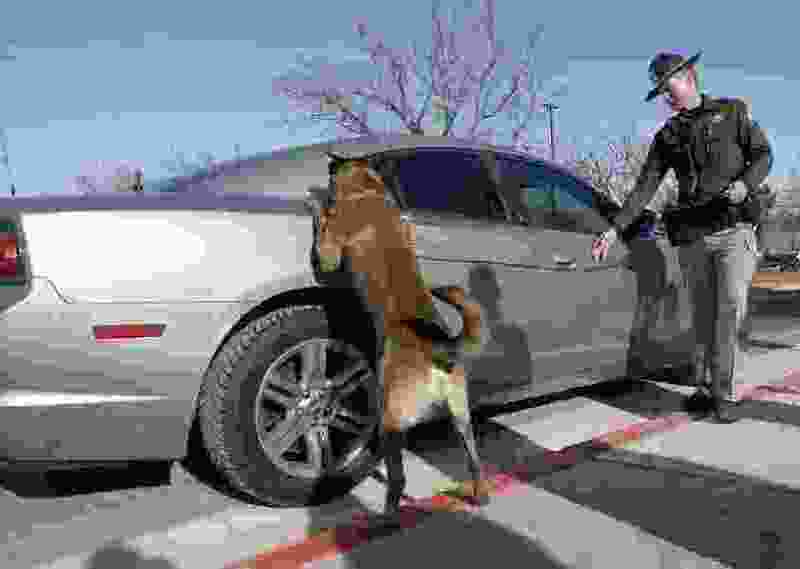 (Al Hartmann | Tribune file photo) K-9 officer UHP Sgt. Randy Riches and drug-sniffing dog Terro do a training exercise Monday, Dec. 18, 2017. The board of directors voted unanimously for the resolution, which now will go to a vote by league members. While the resolution does not encourage voters to reject Proposition 2 — which allows qualifying patients with a doctor’s recommendation to obtain a medical marijuana card and purchase cannabis products — the board’s discussion suggested a broader opposition to the initiative itself. St. George Mayor Jon Pike said it was important for the board to state its concerns before Utah lawmakers consider a “true” medical marijuana program. And North Salt Lake Mayor Len Arave expressed skepticism that Proposition 2 would effectively limit cannabis use to legitimate medical needs. Arave’s comment followed a presentation to the board of directors by Bountiful Police Chief Tom Ross, who is also president of the Utah Chiefs of Police Association. Ross described Proposition 2 as “loosely written,” suggesting passage of the initiative would blur the line between legal and illegal use of cannabis. He gave the example of someone using marijuana on the street outside a restaurant. Under Proposition 2, a law enforcement officer would lack probable cause to question that person, he said, and at most the penalty for a violation would be a civil infraction and $100 fine. Ross was also asked by league board members about the impact of medical marijuana legalization on K-9 units, or police dogs. Because the animals are trained to locate and respond to a number of illegal substances, including cannabis, Ross said it’s unclear whether they could be retrained or would be rendered inoperative by Proposition 2. Schanz said marijuana’s benefits for patients outweigh the impact on trained police animals. Asked about Ross’ example of a marijuana user outside a restaurant, Schanz said all current laws continue to apply to individuals who use cannabis without a medical marijuana card. And for patients who do qualify, he said, Proposition 2 prohibits smoking marijuana or using cannabis in any form in public. Schanz said the objections of the Utah Chiefs of Police Association and the Utah League of Cities and Towns are based in the current attitude toward marijuana. If Proposition 2 passes, he said, medical cannabis will no longer be “verboten” and can be dealt with similarly to other prescription drugs. On Tuesday, the Utah League of Cities and Towns also voted unanimously for a resolution supporting legislative action to increase the state’s gas tax. Voters will consider a nonbinding question on that subject in November in addition to medical marijuana. The league’s actions come one week after the Salt Lake County Board of Health voted to endorse Utah’s Proposition 3 — an initiative to fully expand Medicaid in the state — but remain neutral on Proposition 2, according to a report by FOX 13.